Previously there was no way to change the sorting. It was always sorted by date created, from newest to oldest. Click that to rename the recording. Easy! Previously this was only doable from the slice manager, which required lots of clicks. If you have courses for sale on Soundslice, your channel will now have a “Courses” tab. Example here. For slices with really long titles, the layout of our player’s “controlbar” (the section with the play button) was slightly ugly/broken. That’s now fixed. For search results in Soundslice Channels, clicking to subsequent pages (after the first page) didn’t actually work! That’s now fixed. After you delete a course, you used to be redirected to the list of courses you’re a student in. You’re now redirected to the list of courses you’ve created. When dragging over the waveform in the syncpoint editor, previously it was possible to make super-small loops — often by mistake/misclicking. Now we’re enforcing a minimum size for those loops, to prevent this. In the syncpoint editor, clicking on a syncpoint now seeks the audio/video to the syncpoint’s timecode. Previously, clicking on a syncpoint (without dragging) did nothing. 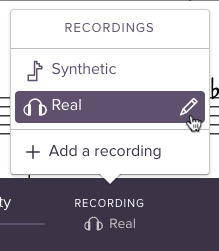 Our notation editor’s “Add track” function now supports a couple of eight-string guitar tunings. Our site no longer has a “More” menu in its main navigation. We decided it was too much clutter. All that stuff has been moved into a site footer.